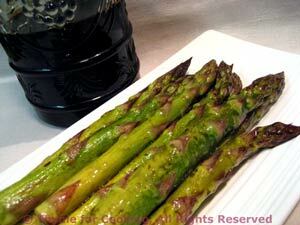 Roasted Asparagus Balsamic, easy recipes for vegetables. The soy sauce and Balsamic vinegar coat the asparagus, giving it a slightly sweet, slightly salty flavor. You can do these on the grill, in a grill pan or roast them, tips toward the door, in the oven. In small bowl whisk olive oil, soy sauce and vinegar. Pour it onto a plate or the baking sheet and roll the asparagus in it, thoroughly coating (use your fingers!). Grill, using a pan, over indirect heat for 8 - 10 minutes, until lightly browned or roast in 400F (200C), oven for 15 minutes. Remove and serve.